Radiesse® is one of the "stiffer" dermal fillers available, which means it's robust enough to give the effect of cheek or chin implants, and can lift deeper facial lines and wrinkles better than some of the softer fillers. In addition to being approved for use in the face, Radiesse® is the only dermal filler to be approved by the FDA for hand augmentation, to correct volume loss from aging, & is our filler of choice when it comes to restoring the appearance of youthful looking hands. 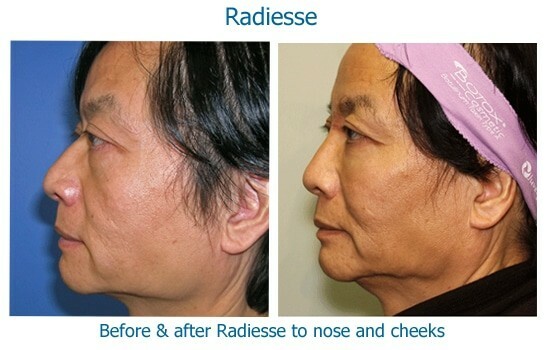 Radiesse® is often used to improve the deeper folds such as the nasolabial folds (running from the sides of the nose to the corners of the mouth) and the marionette lines (running from the corners of the mouth down to the jaw line). 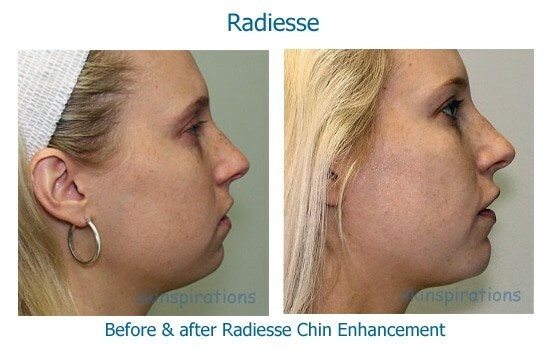 Radiesse® is also a good choice for restoring or enhancing the volume in the cheeks, augmenting the chin and jaw line, and making a bumpy nose appear smooth (nonsurgical rhinoplasty). 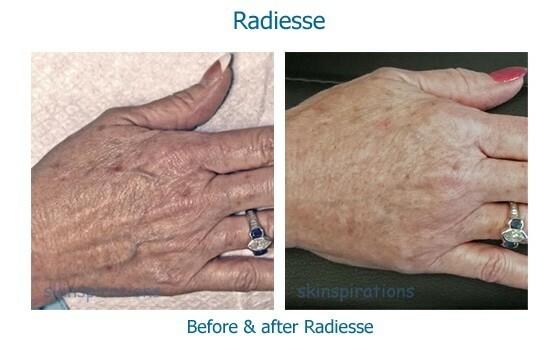 Other areas of the body where Radiesse® can be used are in depressed scars or in the back of the hands to make bones and veins appear less prominent. Made of calcium-based microspheres that have been used safely in surgical implants for years before being approved in cosmetic use, Radiesse® gives immediate results that also stimulate collagen growth and skin thickening that lasts even after the filler is gone. 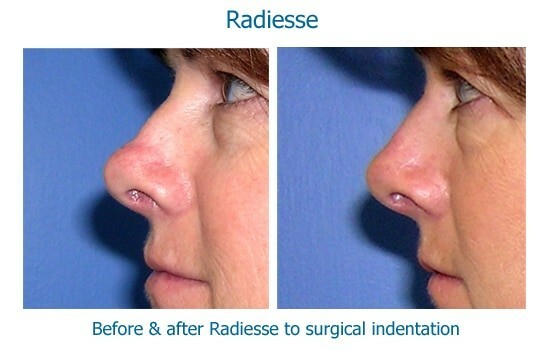 In our experience, results from Radiesse can last up to nine months, on average. At Skinspirations, we use Radiesse® with an anesthetic included, to make the injections almost painless. The entire treatment usually takes less than 20 minutes. There may be some swelling and redness in the treated area for a day or two afterwards. As with any injection, bruising is a possibility, so remember not to schedule this treatment within a week of an important social event. How much does a Radiesse® treatment cost? A Radiesse® treatment, on average, ranges from $675 to $1,148, depending on the amount used. Be sure to take advantage of this limited­-time offer by signing­ up to get your RADIESSE Xperience Visa Card before your next RADIESSE treatment. Call 727-571-1923 now for a free consultation to see if Radiesse® can help you achieve the look you've always wanted. Be sure to sign up for our monthly newsletter that contains specials and promotions.